I love paper crafts, and Christmas is the perfect time to experiment with new decorations. I wanted some little trees to add to my buffet that would lend some height to the long table. These paper trees cost me less than $20 and an hour to make. These are so simple and would be perfect for a craft party. Even kids can make these. Hello paper trees, I love you to pieces. We picked up a much larger tree this afternoon… It was a slightly more expensive than these. I’ll be finishing up Christmas decor this weekend and posting pics next week! PS-I feel like watching Love Actually and Home Alone. And drinking cider with Red Hots. And wearing fuzzy slippers. End Christmas past time cliches. This weekend my cousin came to visit, and one of our first priorities was to hit up some of my town’s amazing flea markets. She scored a gorgeous white headboard for $30 (wish I had taken pictures), and I found these vintage pink wire baskets. I walked by them at first thinking, “Those are cute, but what would I do with them?” About 2 seconds after I imagined using them for storage in my dressing room, she announced, “You could hang them on a wall and use them like shelves!” Yes, we are kin. So, I happily forked over $18 and had instant shelving for my collection of clutches, hats, and scarves. I made the button art at a craft party last year. I found the idea here on Design*Sponge. Also, I’m guest posting today over on VIew Along the Way. 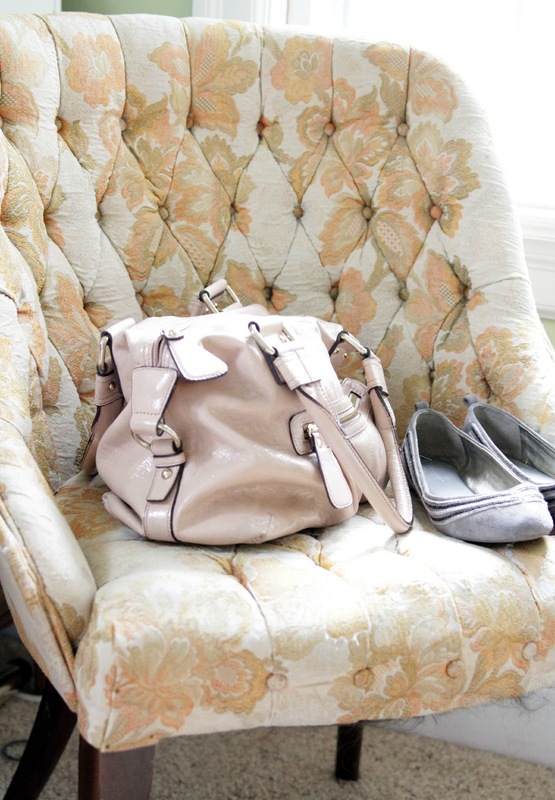 Kelly has a great series that showcases bloggers’ homes. I’ll be talking about being content with aspects of your home even though they may not be exactly what you had in mind. Head on over and say “hello”! Apparently I’m a little behind in blog world and am just recently getting swept up in ombre obsession along with everyone else. I decided to combine two things that I’ve loved seeing on Pinterest lately: OMBRE + PAINT CHIP ART. I found the gold frame at a flea market several months ago for $12 and had been waiting for something to house in it. The paint chip art was FREE, since I painted the matting and made two four trips to home improvement stores to collect the chips. Maybe I just have a guilty conscience, but my husband had to keep reminding me, “You’re not stealing. They’re free chips.” Regardless of this true statement, I feel the need to sport a trench coat and dark sunglasses in Home Depot if ever I decide to do this project again. Since I’m in this room a lot, seeing it undecorated each morning was bumming me out. I had a few pieces that I loved and decided to work with them to build the room. It’s not finished yet but getting there. I found this chair last year at a resale shop downtown that still had the ORIGINAL upholstery . Pictures just don’t do it justice. The fabric has flecks of gold and different hues of coral in the pattern; it’s so stinking gorgeous. I had two gold lamps that I found at a flea mart for $5 each a while back. This summer, I found the shades at World Market and loved the color combo. The room was already green, so I decided to accent with gold, corals, pinks, and purples. The “Fraggle Rock” pillow, as my husband jokingly deemed it, is from Pier 1. 1. First of all, I recommend getting more paint chips than you think you’ll need. You’ll want to sort the chips into colors and then hues. I had all the lightest up top and worked my way down. That makes it easier to visualize what the final product will look like. 2. I laid one row out at a time and then glued it down. I used extra strength glue sticks, which were awesome. I avoid using spray adhesive because I wind up getting it all over my floors and furniture no matter how hard I try not to. I’ve read that plenty of other people used it for their paint chip projects and loved it. 3. Make sure that you are laying the chips down straight, or your whole pattern will be thrown off. I’m sure a more precise person would’ve measured, but I didn’t want to take the time. After you finished gluing down your chips, trim off the edges of those that overlapped on the side of the poster. I started with smaller paint chips and worked for several hours. (My first attempt is above.) Then I started over again with larger chips. I actually ended up leaving a little white space between each chip which allowed me some wiggle room as far as lining them up perfectly. I am all for cheap/free art, so this project was great despite being time consuming. Clean up was “fun” to say the least. And I will never walk into Home Depot without the “Mission Impossible” theme song running through my head. One of the first things I wanted to do when we bought our house was to cover our blank walls with unique art and decor. I didn’t realize that most of the art I loved was way out of my budget. I didn’t want the same prints from Target or Bed Bath and Beyond that I’d seen a hundred times, as much as I love other things from both those stores. Thankfully, Etsy provides us with a plethora of options these days. But sometimes even a $30 print from Etsy feels like too much. I’ve found a few thrifty ways to imitate the look I want for less. 1. Print something you find online on your favorite wrapping or srcapbook paper. I knew I wanted silhouettes and just couldn’t seem to create my own, no matter how hard I tried. I searched online and found two free images that I loved. I scrounged around the house and found some of my favorite wrapping paper left over from Christmas. Ridiculous as it may sound, I was actually excited that I’d get to see this paper all year. If I was a wrapping paper, I’d hope to look like this one. When you love the print of paper that much, you should just find a way to use it in decor, right? I used card stock as my guide and cut the wrapping paper to a standard sheet size. Feeding it through the printer can be tricky. Just keep trying, and eventually it works. 2. Find a great book and frame the illustrations in a series. My sweet friend Dana had this great book, Insects of Surinam, that is filled with vivid images of flowers, plants, and an array of crawling creatures. We loved how unique they were compared to stock botanical prints you see in stores. We joked about ripping the pages out and then framing them. Well, she did. Then I did, and now I’m planning to do the same for some clients above their mantle in a formal living room. From Barnes & Noble. A STEAL. The hardest part was choosing just four. 3. Trace a shape and create your own oil pastel art. Something about artichokes… Not only are they delicious, but visually they’re so iconic and beautiful. I’ve seen some great prints online, but couldn’t commit. I also kept thinking about the Andy Warhol soup cans. They’re so bright and playful you can’t help but love them. I wanted to merge these two things for my kitchen art. I’m not really sure that came through, but these were my inspiration for the artichokes. I’ve NEVER worked with oil pastels before, so this was a learning experience for me. Since I traced my shape first, it turned out to be easier than I thought. If you’ve been frustrated by blank walls or almost passed out due to sticker shock on great art, try to make something you love. 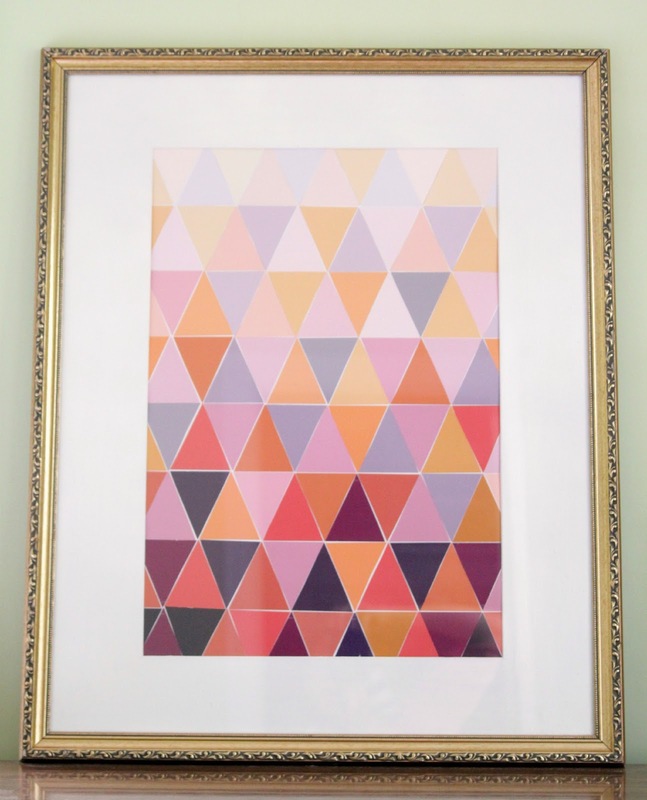 You really DON’T have to be artistic to create personal art for your home. It can be as easy as cut, frame, and hang. This very well could be my biggest DIY to date. That, my friends, is not wallpaper. It is several hours worth of work using a paint pen and a piece of cardboard. It’s not for everyone, but this project only cost me $15! 1. The total cost was a mere 5% the price of the wallpaper I had picked out. Seriously. 2. If I tire of the pattern (which is inevitable at some point), I can simply paint over it. 3. I discovered that trying something that once intimidated the life out of me could pay off. Like many blogoholics, I too have been enamored by the amazing stenciled wall projects out there. Here are just a few of my favorites that nudged me over the edge to try it myself. Above is Emily’s office (Jones Design Company). I decided to imitate her stencil. She was inspired by these curtains from Ballard Design that I had been admiring for a while. Please forgive the dreadful pics…This was pre-Cannon 60D. 2. Next I traced the stencil on my entire wall in pencil. I started at the top and traced vertically down the wall. If I had to do it over again, I would start on one side and trace horizontally across the wall first. This would have saved me a lot of erasing and repainting. (I did admit to the trial and error at the beginning, remember?) This was the hardest part. 3. Then I used white paint pens to go over the penciled tracing. It is by no means perfect up close, but from a distance the pattern looks mostly uniform. All my friends who saw the project wanted to know how long it took me. Honestly, I don’t know exactly, but would guesstimate between 12-15 hours. I came home from work each day, turned on music, and worked until bed time for four days. That’s where the patience comes in. Be sure to “stop by” next week. 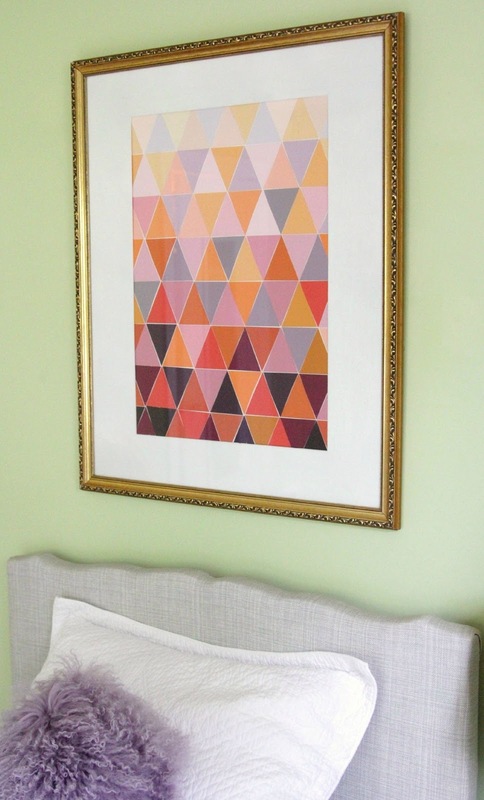 I’m going to share three DIY art ideas to solve the “BLANK WALLS” dilemma. One of the only places in my home that I am totally content with is my entryway console table. For some reason the stars aligned, and I wouldn’t change a thing to the set up or accessories. This doesn’t happen often, as I almost always change my mind about a space or have a plan for improvement. (If my husband were reading this, there would be an audible , “Amen”.) The first set of images is my home. Followed by that are foyers and console tables that I’m pretty fond of. I’m a sucker for symmetry. I started with two lamps I loved and two of the centerpieces from our wedding. From there I just picked small items in my house that I wanted to showcase. The mirrored table was purchased from Pier 1. The “pinwheel frame” was a Christmas project that became a permanent fixture post holidays. I had trouble finding something I liked better for the space. Most of the images below, I feel, tend toward fashion rather than function. In truth, mine does too. Our back entry is where all the keys are thrown, bags dropped, and mail collects. I’m still on the hunt for pictures of tables that are equally functionally and still fashion forward. So what do you think takes the rump card, function or fashion?